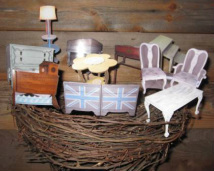 It’s easy — Just email us a picture of the piece of furniture that you would like to have refinished, or choose one of our “incubating” pieces. We can communicate by email or by phone and discuss the best color and style for your piece so that it works the best in your home. Based on the size and scope of refinishing your piece, we will agree on a price. We will then schedule a time to pick up your piece of furniture; and within two weeks, you will have a beautifully refinished piece for your home. I have been blessed with a husband that can build anything. He is a perfectionist and takes the time to make each piece of furniture we create unique and special. Are you or a family member having a baby? 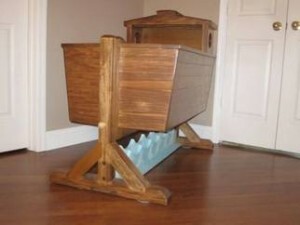 We will build you a unique cradle. You can pick out the theme and we’ll take it from there. We also build beautiful and unique children’s beds. Whether you want a castle for your little princess, a race car, a fire truck, or even a dinosaur, we will build your child the bed of his or her dreams. We love to take antique and vintage pieces and turn them into bathroom vanities. We started doing this when we were in the process of remodeling our master bath. We found that the price of vanities was just so outrageous — and, they were nothing special — just run of the mill pieces. We wanted something with character and we’re sure you do too. We can use a piece of furniture that you have, or you can let us know what you are looking for and we will find the piece for you. The price for custom work depends on many factors, but we will work with you to determine the cost. Our motto is: If you can dream it, we can build it!